Most muscle building enthusiasts and athletes pick whey, workout and repeat. So far so good, because whey helps recover faster after a strenuous workout and assists in new muscle synthesis. However, preventing muscle breakdown is equally important to build muscle size and strength, and here comes in the role of casein. Essentially, both whey and casein are milk-based proteins but they respond differently to muscle synthesis. Whey is the watery remnants of the cheese making process and casein is the curdled residue. The protein content in cow's milk is 20 percent whey and 80 percent casein. In terms of similarities both whey and casein are complete proteins with similar Protein Digestibility Corrected Amino Acid Score (PDCAAS). PDCAAS is a method of evaluating the protein quality based on both the amino acid requirements of humans and their ability to digest it. As compared to casein, whey is a quick acting protein. Hence, the body is able to absorb the nutrients relatively quickly. Researchers have found that drinking whey protein leads to increase in blood amino acids levels in under an hour, with peak levels at just under 90 minutes. 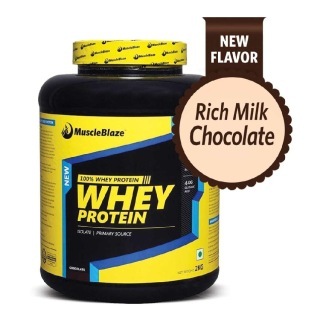 Whey is a rich source of branched-chain amino acids (BCAAs). Being rich in BCAAs, particularly leucine, an essential amino acid, whey helps protect against muscle damage and strength loss during intense training. On the other hand, casein is a slow digesting protein and takes longer to increase blood amino acids but lasts longer with elevated levels lasting over 300 minutes. The primary amino acid in casein is glutamine, which is the most abundant free amino acid found in the muscles of the body. Glutamine is found in large amounts in muscles and is readily available when needed for the synthesis of skeletal muscle proteins. Because this amino acid helps to build and maintain muscle, supplemental glutamine is useful for dieters and body builders alike. Since whey breaks down faster, it reaches muscle fibers quickly after you've worked out. Drink it before you head for exercise and you've supplied your muscles with nutrients to stimulate protein synthesis. The ideal time for whey is before workout and post workout. Casein is slow to digest and clots in the stomach. This reduces digestion and facilitates a slower and steadier release of amino acids. Fortified with glutamine, casein helps to preserve muscles. Preventing muscle breakdown is a bit more important than muscle synthesis. Owing to its slow release attribute, casein provides a trickle of amino acids for a longer period. Hence, it makes sense to use casein before bedtime as a lot of muscle repair happens during sleep. If you're still wondering, whey or casein, the answer is both. Together, they pack a powerful punch as whey works to stimulate protein synthesis and casein inhibits the breakdown of protein. Keep whey handy before and after a workout and rely on the strength of casein during night time to prevent muscle breakdown.